Hello Boys and Girls! Lisa here with an update from one of our most unique Florida attractions. If you remember, in October I wrote to you about Discovery Cove Orlando and how awesome they are, and how amazing their facility is. Well I have more news from them! They are offering some really fun packages for valentines day! (I really can&apos;t believe that&apos;s already right around the corner!) They have three different packages available, all will help enhance your Dolphin Cove experience. There is the Valentine&apos;s Celebration Package that includes a personalized buoy with a personalized message delivered by a dolphin, a photo souvenir frame, t-shirt, gift bag and boxed chocolates plus 25% off the ultimate photo package. Then they have to Valentine&apos;s Sweetheart Package that includes everything mentioned above plus a private cabana and underwater camera. 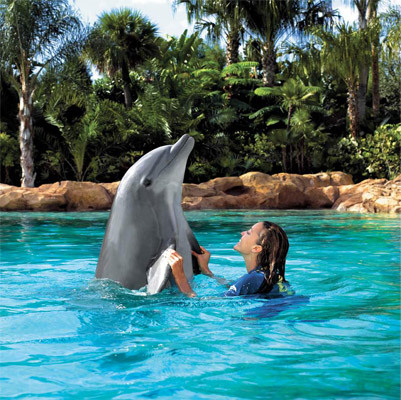 The packages are an additional cost to the normal admission, and do require the purchase of at least one dolphin-swim package. But they do have some great rates right now so it&apos;s really a great deal! In addition to the amazing dolphin swim don&apos;t forget about the coral reef, white sandy beaches, good food, aviary, and amazing lagoon. And as you might recall I went when it was not so warm out and still had an amazing time, so don&apos;t let the Tampa Bay Weather scare you off! That&apos;s all for now, but stay tuned for more Tampa Florida News Update, and other Things To Do In Tampa Bay!